!!!! ONE OWNER CARFAX CERTIFIED , NO ACCIDENTS !!!!!! OVER 20 SERVICE HISTORY RECORDS !!!!! LIKE NEW TIRES !!!!! 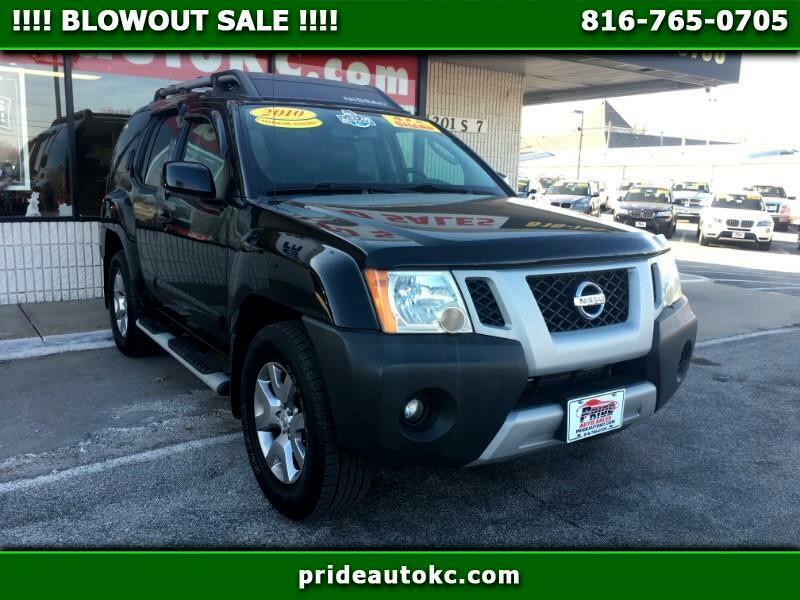 LOOK AT THIS 2010 NISSAN XTERRA, WITH ONLY 122K !!!! 4WD OFF ROAD PACKAGE WITH 4.0 L ENGINE . BLACK EXTERIOR WITH NICE BLACK LEATHER INTERIOR. !!!!!! SUPER CLEAN INSIDE OUT . RUNS AND DRIVES REALLY GOOD !!!! FEW OF THEM AROUND, THIS WILL SELL FAST. DON'T MISS OUT !!!!! 12 MONTHS/25000 MILES POWER TRAIN WARRANTY AVAILABLE !!!! STOP BY TODAY AND TAKE IT FOR TEST DRIVE YOU WILL LIKE THE WAY IT DRIVES AND HANDLES OR CALL US (816) 765-0705 . FINANCING AVAILABLE ..W...A...C...Call or text us at 816-765-0705 today to schedule your test drive. All pricing does not include a 199.00 admin fee. 12 month 25000 mile warranty is only good on vehicles with less than 150,000 miles on them. (see dealer for detail) Call us at 816-765-0705 today to schedule your test drive. Call us at 816-765-0705 today to schedule your test drive.